The ATF raises concerns about Second Amendment rights with a warning that pot is illegal under federal law and users of the drug, even in states where it is legal, can't buy guns. 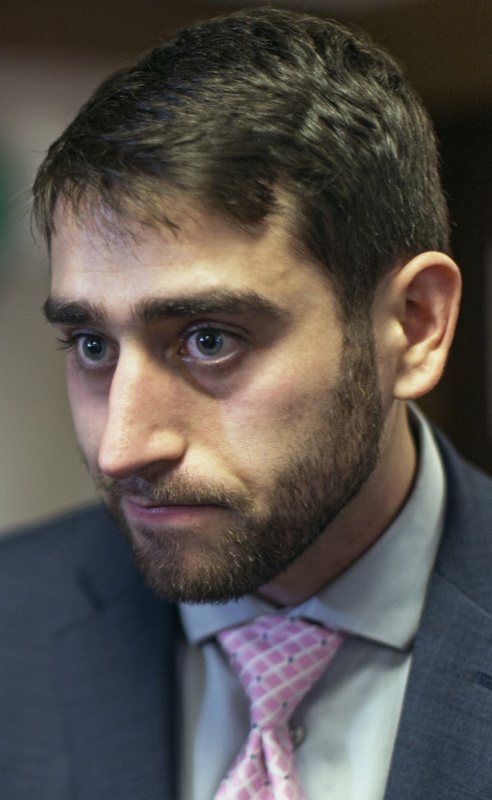 David Boyer, who managed the campaign to legalize recreational marijuana in Maine, said the ATF's warning about gun purchases "is putting a lot of people in an uncomfortable position." Language added last week to Form 4473, filled out by gun buyers nationwide, steps up federal efforts to keep guns out of the hands of marijuana users, even as legal use of the drug spreads. While the federal government has so far taken a hands-off approach to states that allow recreational or medicinal use of the drug, the new language on gun purchase forms is intended to send a clear message that the permissive attitude does not extend to gun ownership. Form 4473 is updated every couple of years. 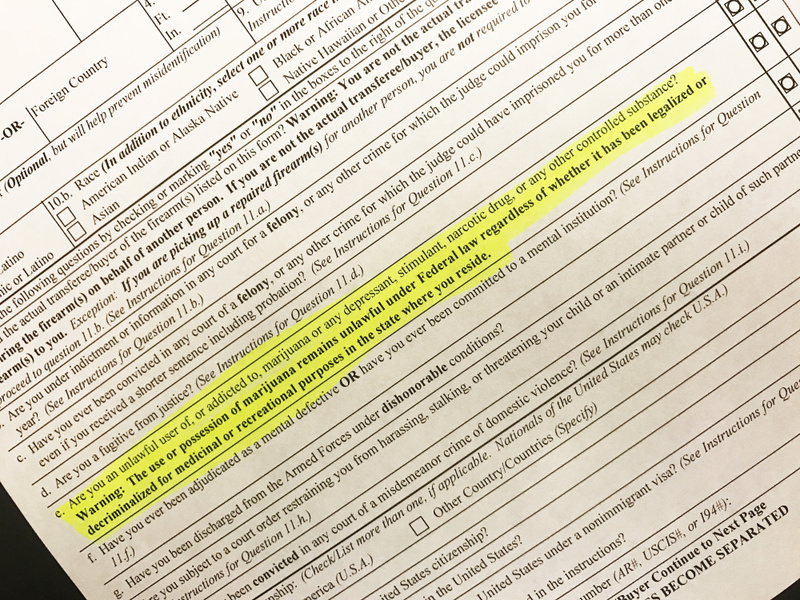 The timing of the new warning on the form is not related to the transfer of power in Washington, D.C., although it comes as marijuana legalization advocates around the country watch to see if the Trump administration will take a more hostile approach to their movement. The revision was intended to make it clear to individuals who are completing Form 4473 that federal law does not recognize the state issuance of medical marijuana cards, said Christopher Arone, a special agent and public information officer for the ATF Boston Field Division. The warning also applies to non-medicinal marijuana use by adults in states like Maine. Federal law prohibits gun purchases by an “unlawful user and/or an addict of any controlled substance,” a provision of the Gun Control Act of 1968. The ATF clarified in a 2011 memo to gun dealers that the law applies to marijuana users regardless of whether the state in which they live has passed legislation allowing marijuana use for medicinal purposes. The ATF had told gun sellers they can assume a person with a medical marijuana card uses the drug, and therefore is not qualified to purchase a gun. 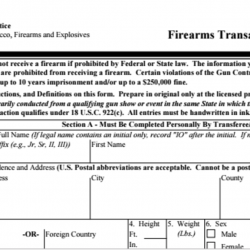 The ATF’s position was recently upheld in federal court. While the prohibition is difficult to enforce and there is no drug-testing required when purchasing a gun, a gun owner could be charged with falsifying the form if the ATF later learns that he or she is a medicinal or recreational user. Unlike in some states, Mainers who become certified as medical marijuana patients do not have to register with the state, so there is no central database that could be used to screen whether a gun purchaser should be disqualified. More than 35,000 medical marijuana certificates had been distributed by Maine doctors as of last year, according to the state, but that number includes duplicate and replacement certificates, and is likely higher than the actual number of patients at the time. Advocates say the federal government is unfairly casting marijuana as a more dangerous substance than it is, and wrongly concluded that marijuana users cannot safely use guns when not intoxicated. They say marijuana users are being deprived of a constitutional right and are pushing for the federal government to reschedule marijuana or legalize it entirely to resolve issues like this. Lewis said the trade group frequently encounters questions about firearms during educational sessions it offers to new patients and caregivers. Before the Form 4473 revision, Lewis and others with the group told people they had to determine for themselves how to answer the question. Some medical marijuana users in Maine feel they are legally using the substance and are not addicted and answer with that in mind, she said. “They had to determine if they were illegally using or addicted (to marijuana) to answer lawfully,” Lewis said. The change in the form has not been widely publicized and many patients may not yet know about the warning. But as patients and other marijuana users become aware of the language added to the form, there is likely to be strong reaction from Mainers who hunt or use guns for protection, Lewis said. The National Organization for the Reform of Marijuana Laws, a Washington, D.C.-based nonprofit, disputes the government’s position that marijuana users cannot safely use guns and believes that responsible cannabis users should be afforded the same legal rights and protections as other citizens. “This is an affront to our constitutional rights and hopefully other Second Amendment groups will stand with us in calling for an end to this practice, but it will likely require the rescheduling of marijuana by Congress,” Erik Altieri, executive director of NORML, said in an email. The National Rifle Association has not gone on the record with a position on either the 9th District Court of Appeals ruling or the revision to Form 4473. The national organization did not respond to a request for comment this week. Correction: This story was revised at 12:35 p.m., Jan. 27, 2017, to correctly spell the name of Christopher Arone, a special agent and public information officer for the ATF Boston Field Division.